We will have available this year Pine Grove Canned Goods which are registered with the PA Dept of Ag and can be sold at markets off the farm. Rachael Peachy is the Amish Lady who will be canning for us. 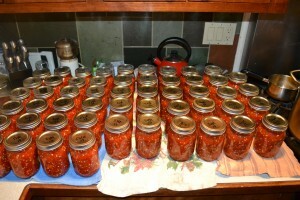 As our nutrient dense organic produce becomes available, she will be canning with our produce. She also will be using other organic produce that we do not raise ourselves. But for the moment, there will be some items available that are not organic and we have listed what is organic and what is not. She uses raw cane sugar. At the bottom is a list of the canned goods available as of now. 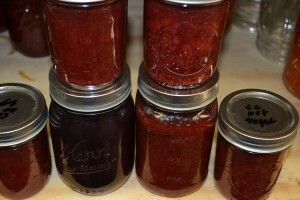 Jams are in 1/2 pints. Everything else is in pints and some of these are also in quarts. You can email us at jomm777@gmail.com to place your order and we will bring those items with us, to market, just for you. You can order any quantity, individual or by the case. 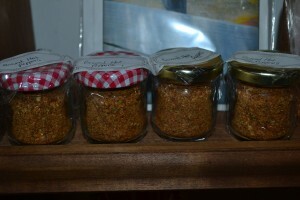 There are 12 jars in a case and you can order a case at a time of the same or mixed items. Cases can be of quarts or pints and/or 1/2 pints. Price for organic cases will be $80.00 for quarts and $48.00 for pints and/or 1/2 pints. 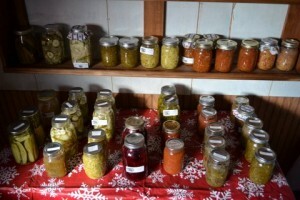 We also still have some of our owned canned items which can be purchased at the farm. We can also deliver them to you off the farm, but cannot have them out for sale. We have organic apple kiwi sauce, quince jam, stew starter, and salsa. We also now have a limited supply of tomato juice, vegetable soup, chicken noodle soup(with gluten free noodles), and tomato soup available by the quart for $8.00 each, all made using organically grown produce or meat. Our own Corn Relish and Sweet Hot Hoagie Relish are both now approved by the Dept of Ag for resale and is being made for us by Rachael Peachey. We also have some organic sauerkraut.